I have been spending the last few weeks polishing up 2010 Business Plans and Budgets with many of my clients. Some have jumped into the process with both feet, others want to test the water and a few say they “can’t swim” meaning they are procrastinators. Which group do you fit into? Now, what are the three actions that you would take to reverse the sales trend? Select three actions that would help you accomplish this initiative. 1. Look at your sales mix (the composition of your sales). Which categories of merchandise sold the best and which the least? What actions should you take? 2. Analyze your customers to determine who purchased the most and the least. 3. Review your promotions and determine which produced the most and the least response? Continue the process by always focusing on three areas and three actions. Assign someone to be accountable for each area and each action even if it is you. Set goals, expectations and accountability for each area. If you get this far, chances are you will continue with the process. 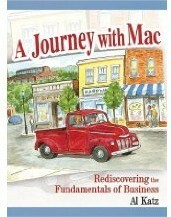 If I have piqued your interest, download a free copy of my latest book, A Journey with Mac. There are several chapters devoted to Action Planning and even how to create an Action Plan. Begin now and push the year-end excuses aside. Procrastination destroys more ideas and businesses than anything else.